Glorious Media Group's Live Help features a user friendly, web browser based interface accessible from any PC or Mac computer connected to the internet. These is no software to download or install, no obligation or contract to sign. How does our Live Customer Support Compare to the Competition? Provides web based operator interface available on ANY PC or Mac computer connected to the internet, anywhere in the world. Admin Software must be Downloaded and Installed on ALL computers to be used by customer service operators. Provides real time customer service through a customized chat window. When enabled this feature automatically invites users to specific channels or web pages. Provides actual visitor data such as search engine used or page referral, page trail, IP, Network and PC specs. Live Help Button Customized to Match Your Web Site's Color Scheme and Feel. No Contracts Are Required -- Cancel Anytime. Price for a Basic Setup and Monthly Service Fees. The Price You Will Pay for 1 Year of Service for 1 Operator. The Price You Will Pay for 1 Year of Service for 3 Operators. Purpose Driven Organization, Christian Owned and Operated by Servants of the Lord Jesus Christ. Q. Do you provide Live Help staff to answer our customers questions? A. No we do not. We provide the software, custom designed icons, interface training and support. Members of your staff are responsible for answering customers questions. Q. Does Live Help require software download and/or install? A. Typically no it does not. 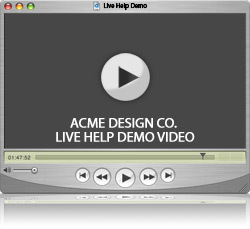 Live Help is web based, easily accessible through a web browser using a PC or Mac with an internet connection. In some cases Live Help is installed on our client's server. Q. How long does it take do install Live Help on our website? A. In most cases 2-3 business days, though same day service is also available at an additional charge. Setup requires a minimum 15 minute training session (often handled remotely) and the implementation of Live Help icons on your website which can be handled by our web production department. Q. What is the financial investment associated with Live Help? A. Live Help is one of the most affordable customer service solutions available today. To implement Live Help on your website we require a $349.00 setup fee and $9.95 per operator per month. The rule of thumb has proven to be 1 Live Help operator per 500 visitors/day on your website. A. None, you can cancel any time however since Live Help has proven to pay for itself usually within a few business days, it is a cost effective value added component your business will not want to do without. Please fill out the form below. An Glorious Media Group representative will contact you according to the time specified herein.